Many of us might share the same opinion that spin-off games shouldn’t be tricky to execute, but for some reason, they really are. You think it wouldn’t be that hard, and yet different spin-off series that are not a part of the main franchise seem to either do well or just fall flat. It should be rather easy. You would just take what worked in the main games, then use that thinking, and put it into a different genre that you would like to base a spin-off game around. 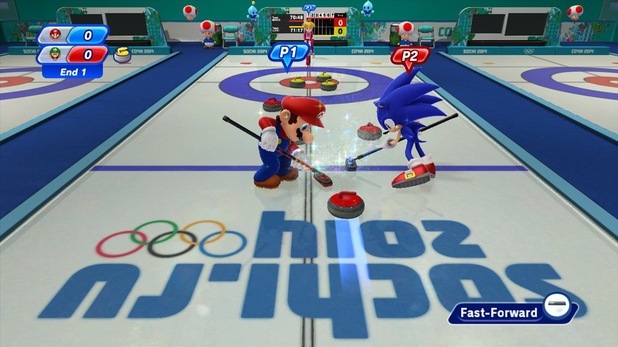 The Mario & Sonic at the Olympic Game series is one of those spin-off series that for some reason or another, can’t get off on the right foot and do well. The series started back in 2008 when its first game was released on the Nintendo Wii and on the Nintendo DS. The series so far has gotten mostly mixed reviews. This spin-off series has some fans, but I haven’t seen many people who highly recommend it. 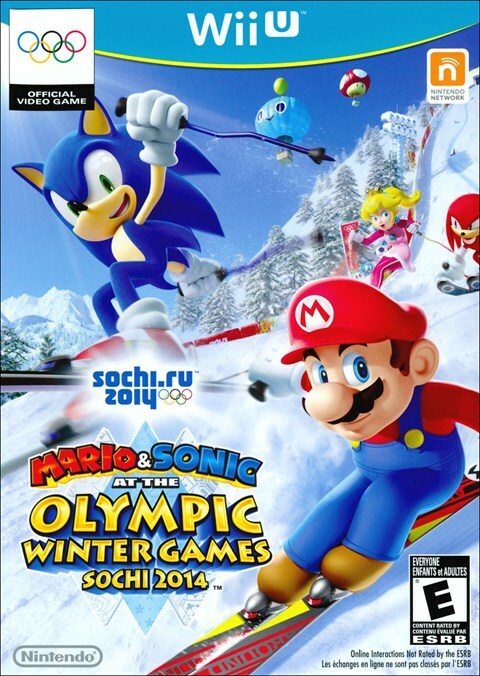 How about we see if Mario and Sonic’s most recent adventure into the Olympic Games with Mario & Sonic at the Sochi 2014 Olympic Winter Games for the Wii U helps or hurts the franchise? These kinds of games aren’t really known for story with these kinds of games, but there is a single-player mode. This single-player mode has you go through five different areas competing against shadow versions of the characters in the normal Olympic events, and fighting a boss in an Olympic Dream event to win a giant trophy. I know a story mode wasn’t the main priority for this game, but it would have been kind of fun to see why they were all there competing in the Olympics. 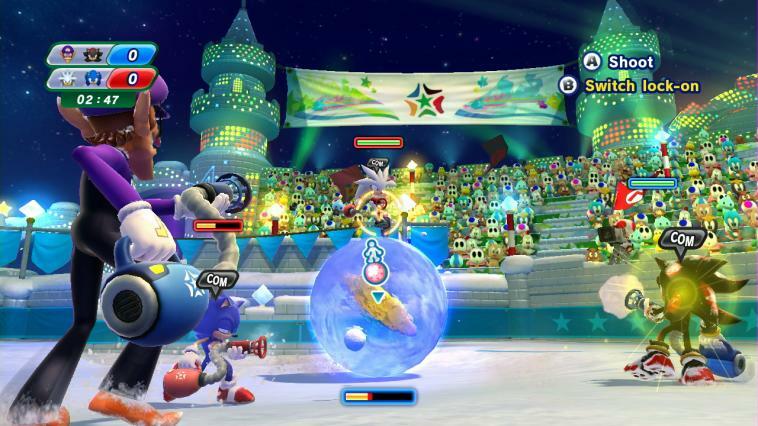 Mario & Sonic at the Sochi 2014 Olympic Winter Games is a party game through and through. You have a pretty solid selection of characters that you can choose from who are categorized in different classes. These classes are speed, power, all-around, and skill. Some characters actually do better in certain events than others, so choose wisely who you want to play as in the different events. You go through a multitude of winter Olympic games like snowboarding, biathlon, skiing, curling, figure skating, ice hockey, and bobsled, to name just a few. Some of these events have more than one variation of the sport, which means, even more games. For example, ice skating as short track 1000m and speed skating 500m. Another example is figure skating has single or pair events. Some events even have up to three variations like skiing. For the most part, you will be using the Wii-mote Plus for a majority of the events, while events like snowboarding and the biathlon have you using the Wii U GamePad. Some events like the Biathlon use both controllers. I will talk about my opinion on having to use both control schemes later in the review. You will just have to wait and see what I think about this specific feature in the game. As for modes, you can play the events individually, play against people online, compete in a weak excuse of a story mode fighting against shadow versions of yourself, play events in a Q&A fashion, or take part in assorted medleys made up of different events. You can also custom make your own medley of events. My favorite parts of the game are the Dream Events, where you play through an assortment of really creative made-up events, like a bullet bill sledge race, a snowball fight, a snowboarding event that is more like a stripped-down Mario Kart, and hole-in-one curling. You get the idea. These Dream Events are the most creative and fun thing to play through in this entire game. Online mode only has a few events which includes snowboarding and skiing. The connectivity actually worked well for me. I am always worried nowadays, due to a majority of games having to deal with online connectivity issues on their respective consoles. Overall, with the character selection, the Main Events, the Dream Events, and the four modes that come with the game, you’ve got a decent amount of variety with the entire game. The game is graphically stunning. Everything just looks great. It’s bright, colorful, well-animated, and the graphics are just gorgeous to look at. The music is also pretty solid, with some beautiful main themes and some good remixed versions of popular songs from Sonic and Mario’s franchises. This is definitely one of the game’s strongest features. However, once you play enough of the game, you start to see a bunch of issues pop up that make the experience less stellar. First off, let’s talk about the controls. The Wii U GamePad controls are fine, but the Wii-mote Plus controls are still rather finicky. This control issue has been a common complaint I have seen throughout this spin-off series, and it is a bummer that it’s still an issue. They aren’t flat-out terrible, but sometimes, I felt like the controls weren’t working for me when they needed to. Also, the developer who thought that the curling event needed rapid shaking of the Wii-mote needs to get fired because my wrist hurt like heck during certain events. This also leads to the player holding the GamePad to having the advantage control-wise over the other players in multiplayer. The necessity to switch between the two different controls is a bit tedious, since you have to have both of them at your command during certain events like the biathlon. This also leads into the game’s almost non-existent story mode where you will need to master the events, but due to the finicky control issues, they don’t become fun, and are more tiresome. I also found most of the Main Events to be a total bore. Some of the events are pretty fun, and I did enjoy a few of them, but I don’t know why they were going for such a realistic feel with these events. Why couldn’t they have just focused on making the Dream Events the main part of the game? Those are easily more enjoyable, more entertaining, and more creative than the main events. I know some people have complained about the simplicity of the games, and that is an issue. It isn’t a huge buzz-kill for me, but it’s there. Simplicity is fine, but you have to pull it off well, and overall the simplicity in the gameplay department was hit-and-miss for me. The snow levels in the Main Events, while pleasing, are in essence, forgettable. My final complaint is about the game’s more realistic vibe. 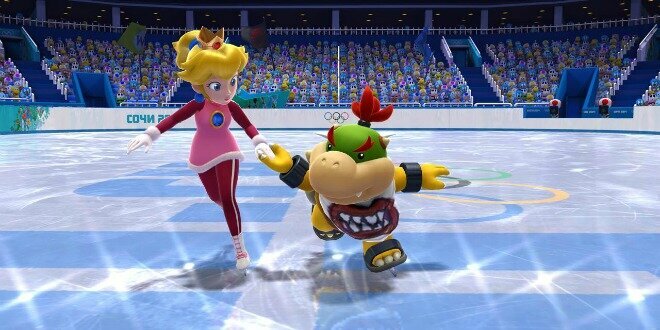 Why is a game starring Mario and Sonic characters trying to be realistic with their sports? I don’t play Mario & Sonic for realism; I play them for fun and their creativity within the game design. If I wanted to play a game with realistic physics or gameplay, I would pick up one of the many EA Sports titles. I just think this franchise could really excel in being more over-the-top-arcade centric with its gameplay in the future. In the end, this game is just decent. I honestly had fun when I was first playing it, but after playing it for multiple hours in a row, I started to find the faults within the game right away. It’s a shame, because there are some cool ideas here, like the Dream Events, but it’s bogged down by issues that have plagued the series for a few years now like iffy controls, bland level design, and other gameplay issues. Maybe they should give this game to a different developer, like Sumo Digital that made the awesome Sonic and Sega All-Star Racing Transformed game. I bet they could have done something creative with the game. I also find it odd that Nintendo and Sega keep making sequels to this spin-off series. Maybe it’s because the reviews aren’t always good, but the sales numbers are. This bugs me a little since it supports the idea of a game getting a sequel even when the reviewers and the players say the game is not that strong, but the game rakes in a lot of money. I don’t think it’s the worst spin-off series ever, but there needs to be something done with the next game. Maybe I will write up a concept for a sequel game in the future. If you want to get a good game for the Wii U to play with your friends, you are better off waiting for Super Mario 3D World, or getting Wii Party U or Game & Wario before getting this game. I am sure this game will have its fans, and if you enjoyed this game more than me, then by all means enjoy it. For me, I will just skip it and return to the more classic Mario sport games and Wii Sports Resort.